It is March 2003 and I am standing in the snow at the big crafts, antiques, art and soviet tat market at Ismailovsky Park in Moscow. Mike – a colleague from work – is holding a rather lovely bakelite radio that looks as if it is from the early sixties. In the end he will not buy it and then spend lots and lots of time regretting not having bought it, despite my answer that, a: it looked fairly real to me, and b: that it was a lovely thing and obviously gave Mike pleasure as an object. So what did its provenance really matter? I thought about this exchange quite a lot during the first part of this course. Before I started Context and Narrative, I was aware of “documentary” as a politically or socially motivated thing, rooted in the 1920s and 30s. I knew of Grierson and had distant memories of seeing Night Mail. I had seen Fires Were Started and other WW2 documentary/propaganda films. Somewhere on my bookshelf was a Best of Picture Post compilation and I knew a bit about Walker Evans and the FSA, but I was more likely to associate Documentary as a genre with the moving image. I also knew that Documentary was engaged and Documentary was on the side of the masses. But, although I should have really, I did not consider fabrication to be part of documentary methodology. Documentary as a movement was also a thing that seemed to have ground to a halt around the same time colour bled into the photographic world in the 60s. Of course, I should have taken a photograph of Mike’s radio as we stood looking at it in the snow, but of course, I did not. So in trying to pick this apart a bit, I will refer to 3 well-known photographs. So, returning if it was a repro-fakey thing, would Mike’s radio have been any more ‘real’ than if it had been made to stand on a sideboard in a spanking new Krushchevka flat in the late 50s? That all depends on what Mike wanted to do with it. First, If he had wanted to sell it as an antique when he got back to the UK, then yes, it would have made a huge difference. 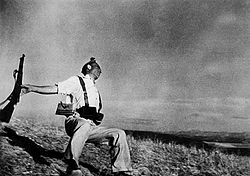 Like Capa’s dying republican soldier it would have much less value (and open the person saying that it was what it was up to charges of fakery, charlatanry and worse) if it was not really made in the Tsentralny Radio Zavod in Ekaterinburg (say) 60-odd years ago. On the other hand, if Mike just wanted a rather nice object to remind him of the 3 weeks he spent in Moscow keeping an eye on our new office there while it bedded in, it didn’t matter a stuff whether it was made before the day stood in the snow at Ismailovsky Park. 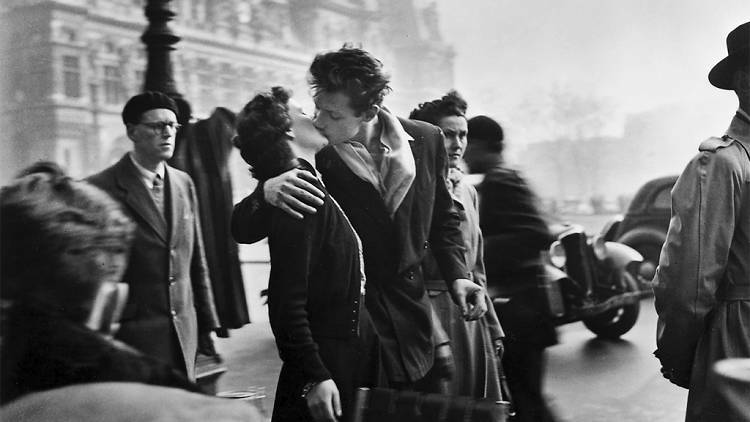 Like Doisneau’s kissing couple, its look and the pleasure it gave to Mike sat on a table in his 50s flat in Elephant and Castle would have overwhelmed its fakery. In fact, if he wanted to listen to radio programmes on it, it may well have been even better if it was a fake as radios have got better and better as the technology has developed. Like Jeff Wall’s imitation it might be much better than the once in a lifetime “capture” of a man indulging in casual racism, unseen by its object. There’s truth and there’s “truth”. Sometimes it matters whether it’s a real truth (usually when there’s some genuine life or death thing involved; sometimes the appearance of truth is the thing. On an earlier trip to Mosco, I bought a seven-day submarine clock from a different market. It looks good on the wall and it still keeps pretty good time; I have wound it up once a week since 2000 (give or take a few weeks when I’ve been away or have forgotten). It doesn’t pretend to be anything other than what it is (on its face, below 6 it says Сделано в России – Made in Russia – not Made in the USSR, unlike more recent examples I’ve seen). And that’s enough for me. Postscript: When tidying up my blog for submission for assessment in April 2017, I found this post sitting around in draft form. I have no idea why I did not publish this when it was effectively complete in January 2016. It ties in nicely with the ongoing investigation into the differences between realism and the depiction of the real which has underpinned almost everything I have done in this module. This entry was posted in Context & Narrative, Coursework, Part 1 on April 27, 2017 by Simon Chirgwin. Good summary and to the point.